E-Prime 2.0 introduces three installation options and licenses to assist with designing experiments and running them in a shared lab and in other departments/sites. When the E-Prime 2.0 installation is started, you can choose to install the suite (full design/runtime) or the Subject Station (runtime only). The E-Prime 2.0 Run-Time license can be purchased for labs that need to collaborate with sites that do not have a full E-Prime license. For E-Prime 2.0, only one full system (design with E-Studio) can exist on a machine at a time. One version of E-Prime 1.x and one E-Prime 2.0 can coexist. In scenarios where a lab is shared between departments etc where one lab may require an older version for continuing study and another department wants to take advantage of new features, multiple versions of the E-Prime 2.0 Subject Station installation can coexist on the same lab machine. DEPT1 and DEPT2 share a LAB. DEPT1 is in the middle of a continuing study and they require E-Prime 2.0.8.90. DEPT2 is starting a new study and want to use features available in E-Prime 2.0.10.242. On the machines in LAB, E-Prime 2.0 Subject Station (2.0.8.90) can be installed on the same machine as full/design E-Prime 2.0.10.242. This allows the LAB to run older ebs2 files in 2.0.8.90 and run/design newer experiments es2/ebs2 in 2.0.10.142. 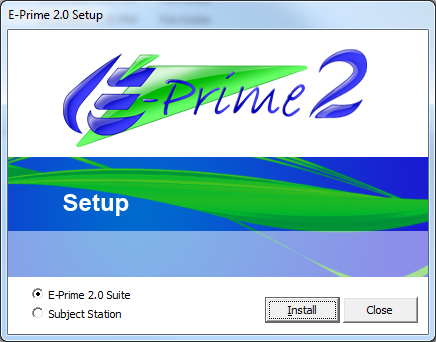 Inserting your E-Prime 2.0.10.242 or later CD will auto run and prompt for installing E-Prime 2.0 suite (design/full) or E-Prime 2.0 Subject Station. For legacy E-Prime 2.0.8.90 Subject Station, navigate into the E-Prime 2.0.8.90 Subject Station folder to begin the installation. The Product Service and Support web site will have download links to all of the editions/versions of E-Prime 2.0 that you have registered. E-Prime 2.0.10.242 and later will have a link available for E-Prime 2.0 which includes the Subject Station installation. Because of its number of usage, E-Prime 2.0.8.90 legacy version also has a Subject Station installation available. Running Experiments with multiple versions of E-Prime 2.0 (Suite, Subject Station, and Run-Time) can be achieved by double clicking the ebs2 file. If a matching version of the runtime exists on the machine, the experiment will begin. If not, the E-Run Chooser option will allow for choosing a different runtime. It is typically recommended to use the direct matching version of an experiment when collecting data. Please see NEW FEATURE: E-Run Resolver dialog allows choosing runtime when no direct match is available  for more information.